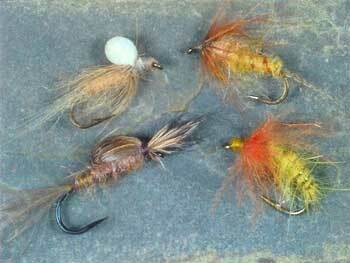 THERE ARE FEW PHENOMENA on a river that excite fly anglers more than a strong hatch. In fact, many fishermen describe their trips to the water more in terms of the insects than the fish. Consider a trip I made to the Missouri River last summer. When someone asked how the fishing was, I inevitably described it by saying, “Well, the morning started with an awesome hatch of tricos. A few PMD’s came off in the early afternoon, and the evening caddis hatch was amazing.” For many of us, the quality of the hatch has as much to do with our feeling about a day’s fishing as do the number and size of fish. Given that this is such a central part of the fly-fishing experience, we should clearly understand what a hatch is and what takes place. First, the term “hatch” is a bit of a misnomer as used by fly fishers. Webster’s dictionary—and most people—define a hatch as something emerging from an egg. Even entomologists use the term to refer to the moment when the young insect escapes from its egg. Entomologists also have a technical term for this: eclosion. Fly fishermen, however, use the term “hatch” to describe the moment when adult insects pop up on the water’s surface and fly off. This occurs after they emerge from a nymph or pupa rather than an egg. The term “emergence” is also commonly used to describe that event. Among fly fishers, hatch and emergence are used interchangeably. In most cases, the hatch happens on or just below the surface. But there are exceptions, and it is important to understand the different hatch behavior exhibited by different aquatic insects. This is the factor that determines what patterns and tactics you should use. Before adult emergence begins, a period known as the “pre-hatch” often occurs. This phase is signaled by changes in nymphal or pupal behavior. For example, the pre-hatch of many stonefly nymphs takes place a few days to a week or more before emergence. During this stage, mature stonefly nymphs migrate from mid-channel areas toward the shoreline, where they wait until just the right moment to hatch. Some mayfly nymphs also exhibit pre-hatch migration within a stream or lake. For example, gray drakes (Siphlonurus sp.) and many mahogany duns (Paraleptophlebia sp.) move from moderately fast currents to shallower and slower areas near shore shortly before hatching. For other species, such as blue-winged olives or the pupal stages of many caddisflies and midges, the pre-hatch does not involve moving to a different habitat. Instead, it simply means an increase in activity. Mature blue-winged olive nymphs drift more frequently in the current. Caddisfly and midge pupae often drift along the stream bottom for several minutes to an hour or more before beginning to rise up to the surface. Specific pre-hatch activity varies considerably between different species, but in most cases it involves behavior that increases the insects’ exposure to feeding fish. For this reason, fly fishers should be aware of the pre-hatch and try to take advantage of it. This most often means fishing nymph or pupa patterns along the bottom several hours to several days before you expect the adults to appear. While many fly fishers may not find this as exciting as fishing surface flies during the hatch, the number of fish caught by imitating this pre-hatch activity will convince most anglers to pay attention to it. Once the pre-hatch ends, the true hatch begins. At that point, there are three main types of behavior to be aware of: terrestrial emergence, sub-surface emergence, and surface emergence. Terrestrial hatches occur when the mature nymph or pupa crawls out of the water so that the adult can emerge on land rather than in the water. Obviously, the adults are not readily available to feeding fish. But the nymphs or pupae crawling towards shore offer a target to hungry fish. 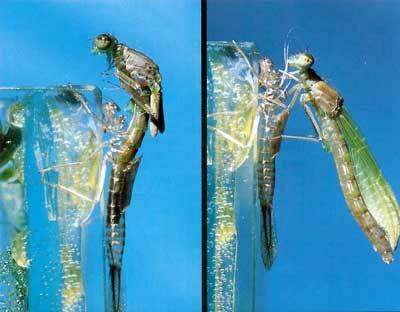 Stoneflies best represent this type of hatch behavior. As noted above, stonefly nymphs migrate from mid-channel to near shore several days to a week or more before crawling out of the water for adult emergence. Nymphs are more exposed to feeding fish during these shoreward migrations and provide some excellent nymph-fishing opportunities. Dragonfly and damselfly nymphs also crawl or swim to shore and then wriggle out of the water before the adults hatch. Trout target the migrating nymphs just like they do stoneflies. Alderflies and hellgrammites add another twist to terrestrial emergence. These insects, both in the order Megaloptera, go through a pupal stage prior to adult emergence. The pupae of most aquatic insects develop underwater. Not so for Megaloptera. In their case, mature larvae crawl out of the water, dig into the soil along the bank, and pupate on land. When the pupae are mature, the adults crawl out of their pupal cells and fly away without ever touching the water. Many aquatic beetle species have similar behavior, which allows the pupa and adult stages to completely avoid swimming predators. Subsurface hatch behavior means that the adult hatches from the nymph or pupa underwater. The adult rises through the water column, breaks through the surface film, and then drifts on the water’s surface until its wings harden and it can fly off. The underwater adults are usually buoyed to the surface by gas bubbles trapped under their exoskeleton, and they are very vulnerable to feeding fish. Numerous species of mayflies, especially in the family Ephemerellidae (pale morning duns and western green drakes, for example), are good examples of this type of emergence. Because of the vulnerable nature of adults exhibiting this behavior, they are an excellent stage to imitate with sub-surface emerger patterns, such as soft-hackles or Flymphs. In this situation, the patterns are best fished with little action. Cast up and across and let the fly sink. If necessary, mend your line so your fly drifts with little or no drag downstream through likely holding water or areas where there appear to be rising fish. Often, such rises are made by fish feeding just below the surface on the helpless adults. As your fly drifts, you can gently raise your rod tip so the fly swings towards the surface. This gentle rising action often results in a solid take. But strikes can also be subtle, and because the fly is underwater you can’t always see the bite. Watch your leader carefully for any unusual movement. At the slightest hint, lift your rod to tighten the leader. If there is a fish on, you will be able to quickly set the hook. If there is not a fish on you can drop your rod tip and continue fishing. This technique works wherever insects with this behavior are hatching, including in riffles, runs, flats, and even lakes. Finally, because the adult (or the dun in the case of mayflies) is rising to the surface, your fly patterns should be tied to match the color and size of the adult, not the nymph or pupa. There can be a considerable difference in color between these stages, so this is an important point to remember. The surface hatch of aquatic insects is such a situation. Surface hatches begin when mature nymphs or pupae leave the relative safety of the stream or lake bottom and swim to the surface. Swimming ability varies considerably among different species, but even the fastest are no match for a trout. During a surface hatch, the first stage you should imitate is the nymphs or pupae swimming up through the water column. Once at the water’s surface, the nymph or pupa hangs in the film while its exoskeleton splits open. At this point, the winged adult wiggles free and pops out on the surface where it floats briefly before flying away. From the moment the nymph or pupa reaches the surface to the time the adult flies away may take a few seconds to more than a minute, depending on the species and weather conditions. During this time, no matter how brief, the nymphs and pupae below the surface and the adults on the surface are sitting ducks for trout. This process seems much better designed to feed fish than to get the adults safely from water to land. For fly fishers, such behavior provides the best opportunity to take fish with dry flies. Surface hatches occur in all major aquatic-insect groups except stoneflies and Odonata (dragonflies and damselflies). The most important are mayflies, caddisflies, and midges. Within these three groups, dozens of species provide fly fishers the opportunity to see and catch fish feeding with abandon on the surface. But not all the activity is surface feeding. What appears to be surface feeding is just as often fish hunting nymphs or pupae below the surface. Or the fish may be chasing insects in the surface film that are in the midst of emerging from nymph or pupa to adult. In the latter situation, the insect has characteristics of both nymph or pupa and adult. There are hundreds of patterns designed to imitate the subsurface stage, as well as the transitional stage from nymph or pupa to winged adult. One of the best sources of information about such emerger patterns is the aptly titled Tying Emergers by Jim Schollmeyer and Ted Leeson (Amato Books, 2004). Those individuals not eaten while swimming upwards or while hanging in the film finally become adults on the surface. When fish turn their attention to this stage, it is finally time to get out your dry flies. Again, there are lots of patterns that imitate myriad species of aquatic insects in various types of water. For example, different patterns may be called for when you’re fishing in a fast riffle section versus fishing the same hatch on a smooth, flat glide. Fly-flotation requirements, along with how well the fish can see the fly, influence what patterns will prove most effective. In all cases, make sure your patterns closely match the size of the naturals you are imitating and that you are presenting your flies naturally. Most of the time this will be a “dead drift.” But some species, especially adult caddisflies, run or skate across the surface, and your presentation should match their behavior. The next time you encounter a good hatch, stop to consider what type of hatch behavior is occurring. Are they crawling out of the water, hatching below the surface, or hatching on the surface? How and where are the fish feeding? What size, shape, and color are the naturals? If you can answer these questions, you’ll likely have more to talk about than just a good hatch.